We plan to add additional leg and face vein information is added every week. Feel free to bookmark this page to keep up on vein information. Lasers and leg veins are a dynamic, exciting, and broad field, as is sclerotherapy. Visit http://www.bigveins.com for information about our vein clinic in Modesto, CA. The heart pumps blood filled with oxygen and nutrients to the whole body. Arteries carry blood from the heart towards the body parts. Veins carry blood from the body back to the heart. The squeezing of leg muscles pumps blood back to the heart from the lower body. Veins have valves that act as one-way flaps. These valves prevent the blood from flowing backwards as it moves up the legs. If the one-way valves become weak, blood can leak back into the vein and collect there. This problem is called venous insufficiency. Pooled blood enlarges the vein and it becomes varicose. Spider veins can also be caused by the backup of blood. Hormone changes, inherited factors, and exposure to the sun can also cause spider veins. Who has varicose veins and spider veins? Why do spider veins & varicose veins usually appear in the legs? How can I prevent spider veins & varicose veins? Wear elastic support stockings (ie. Sigvaris, Jobst) and avoid tight clothing that constricts your waist, groin, or legs. Eat a low-salt diet rich in high-fiber foods. Eating fiber reduces the chances of constipation which can contribute to varicose veins. High fiber foods include fresh fruits and vegetables and whole grains, like bran. Eating too much salt can cause you to retain water or swell. How are spider veins & varicose veins treated? Besides a physical exam, we can take ultrasound pictures, ultrasound with flow (Duplex) indications, vein illumination or X-rays of the vein to find the cause and severity of the problem. We have a powerful ultrasound machine in our office. Not all cases of varicose veins are the same. This is a common treatment for both spider veins and varicose veins. We inject a solution into the vein that causes the vein walls to swell, stick together, and seal shut. This stops the flow of blood and the vein turns into scar tissue. In a few weeks, the vein should fade. The same vein may need to be treated more than once. This treatment is very effective if done the right way. Most patients can expect a 50% to 80% improvement. Micro-sclerotherapy uses special solutions and injection techniques that increase the success rate for removal of spider veins. Sclerotherapy does not require anesthesia, and can be done in the doctor's office. We use extremely small needles, which are reserved in our Modesto office only for sclerotherapy procedures. Some of these side effects may improve with anti-inflammatory medication or heat. Anti-inflammatory gels/creams such as Arnica (Arnica Montana) may be of some help. The treated vein can also become inflamed or develop lumps of clotted blood. This is not dangerous. Applying heat and taking aspirin or antibiotics can relieve inflammation. Lumps of coagulated blood can be drained, if these areas are uncomfortable. New technology in laser treatments can effectively treat spider veins in the legs. Laser surgery sends very strong bursts of light onto the vein. This can makes the vein slowly fade and disappear. Lasers are very direct and accurate. So the proper laser controlled by a skilled doctor will usually only damage the area being treated. Most skin types and colors can be safely treated with lasers. Not all lasers have the same capability for treating spider veins. Redness or swelling of the skin right after the treatment that disappears within a few days. Discolored skin that will disappear within one to two months. Rarely burns and scars result from poorly performed laser surgery. Endovenous Techniques (radiofrequency and laser) – These methods for treating the deeper varicose veins of the legs (the saphenous veins) have been a huge breakthrough. They have replaced surgery for the vast majority of patients with severe varicose veins. This technique is not very invasive and can be done in our office in Modesto, CA. We place a very small tube called a catheter into the inside of a vein. Once inside, the catheter sends out radiofrequency or laser energy that shrinks and seals the vein wall. Healthy veins around the closed vein restore the normal flow of blood. As this happens, symptoms from the varicose veins improve. Veins on the surface of the skin that are connected to the treated varicose vein will also usually shrink after treatment. When needed, these connected varicose veins can be treated with sclerotherapy or other techniques. Current treatments for varicose veins and spider veins have very high success rates compared to traditional surgical treatments. Over a period of years, however, more abnormal veins can develop. The major reason for this is that there is no cure for weak vein valves, not even surgery. As time goes on, pressure gradually builds up in the leg veins. Ultrasound can be used to keep track of how badly the valves are leaking (venous insufficiency). This can be counted with seconds of reflux as seen on duplex (color) ultrasound. Ongoing treatments can help keep this problem under control. This means that at times several routine vein procedure sessions may help. The most important thing a person can do to slow down the development of new varicose veins is to wear graduated (tighter around the ankles than along the thighs) compression support stockings as much as possible during the day. Can laser hair removal be done with the vein laser? At Surgical Artistry, Inc in Modesto, CA, we have a laser that is taylored specificly for veins. However, it has been used by others for laser hair removal. We can use it to remove some small hairs. Several sessions of laser hair removal are needed. We can also recommend places that specialize in laser hair removal. If you mainly have a leg vein or facial vein problem, we can discuss small spots of laser hair removal as well. We do have an esthetician on staff that can perform waxing if you prefer. A great use of our laser is used for red marks, red spots, brown spots on the skin. Call us to set up an appointment with Dr. Calvin Lee. Consultations of this sort are very affordable. Our telephone number is 209-551-1888. Some details about our laser (link). Tattoo removal is something that is sometimes fairly successful with lasers. There are many variables related to the color, age, method of aquiring the tattoo. There are other locations such as Skin Renew Laser Medical Center which offers tattoo laser removal. Acne scars, photo-facials, laser resurfacing are other possible uses of laser technology. We don't currently offer lasers for these uses. You may consider MD Plus Medical Spa, or Advanced Laser Clinics. However, keep in mind, there are other ways of taking care of your skin: we offer consultations on these methods which are without energy sources applied to the face. We offer microdermabrasion, excellent skin care products, acupuncture for facial rejuvenation, and advice on skin health. We have a full time aethetician on staff, plus Dr. Tammy Wu, the plastic surgeon is available for these skin care rejuvenation consultations. What's special about Surgical Artistry, Inc.? Plastic Surgery, General Surgery, Acupuncture, Veins - all related at Surgical Artistry, Inc.
Surgical Artistry, Inc. is led by a husband-wife team of dedicated, friendly, Ivy League trained surgeons who provide services in Plastic Surgery, General Surgery, Acupuncture, and Vein Procedures. 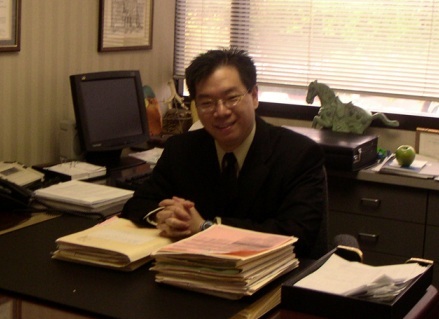 Dr. Calvin Lee is a board certified General Surgeon who specializes in veins, gallbladders, hernias, breast cancer, and acupuncture. Dr. Tammy Wu is a board certified Plastic Surgeon who specializes in breast and body contouring such as tummy tucks and liposuction. They have been practicing surgery in Modesto since 2003. Under the same roof, botox, lasers, microdermabrasion, facials, and skin care products are also available. In addition to superb surgical skills, our focus is communication. Many of our consultations take about an hour to ensure that we become partners in your surgery and that we share the same goals. In addition, our surgical patients have access to our cell phones to call with any questions, and email is also a possible means of communication. We are very comfortable with advanced technology, in fact this web page is made by Dr. Calvin Lee. Our technology advantage also helps us in your surgical / medical care. We only use the highest grade technology and the best materials in our practice. Our high quality standard and accepting nothing but the best is our philosophy for our family, for our lives, and for our patients. There are many other advantages of having a plastic surgeon and general surgeon working together. The practice gets a fusion of ideas and techniques that benefit our patients. For example, for breast cancer, Dr. Calvin Lee and Dr. Tammy Wu frequently work together to remove the cancer and then reconstruct the breast with plastic surgical techniques. The doctors are always discussing ways to combine their talents. Even more special is the addition of Dr. Calvin Lee's acupuncture knowledge which adds a holistic and more natural approach to healing from your surgery. Our synergy of acupuncture, general surgery and plastic surgery is very unique and found very rarely in this world. Come experience it in Modesto, California. If you are committed to self improvement and excellent health; Surgical Artistry is committed to helping you achieve your goals. Modesto Laser website Copyright 2007- Surgical Artistry, Inc. Modesto, CA All Rights Reserved. We're located next to the post office on Sylvan Ave, Modesto. Sclerotherapy with foam for injecting varicose veins. Foam Sclerotherapy for Reticular veins. Laser closure (ELAS, EVLT, or ELVeS), VNUS closure, TriVex (Transilluminated vein extraction - somewhat like liposuction, not lasers, related to TIPPS). Microphlebectomy - removal of veins through very small incisions (about 1mm). This is not the same as vein injections. We have high quality compression garments / stockings in stock. Acupuncture: Please see more complete listing at our acupuncture website. Skin care consultations. These consultations also available with Dr. Wu. Skin care products: Obagi and NIA 24 / medical grade sun screens and sun blocks. Arnica is also available. General Surgeon in Modesto, CA specializing in Veins, and laser treatments.